Even before I had kids, I always preferred date nights at home. A quiet comedy movie date night at home seems like the perfect way to end a busy work week. After my son was born, date nights weren’t so common anymore because my husband and I were always so exhausted. 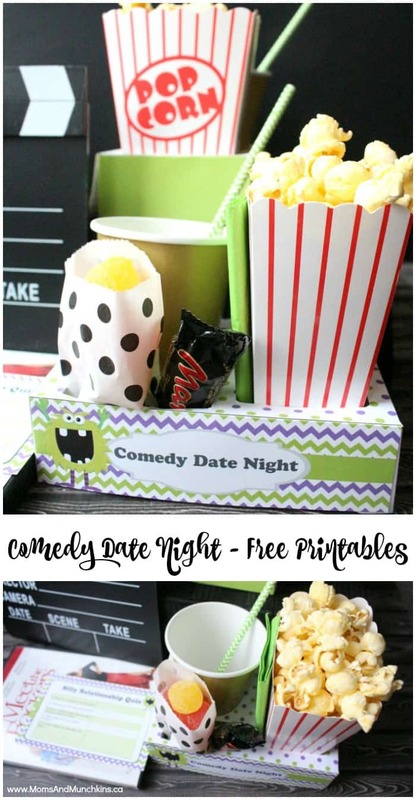 I know many of you have the same troubles – too busy to plan a date night – so I’m here to help with some free printables for a comedy movie date night at home! 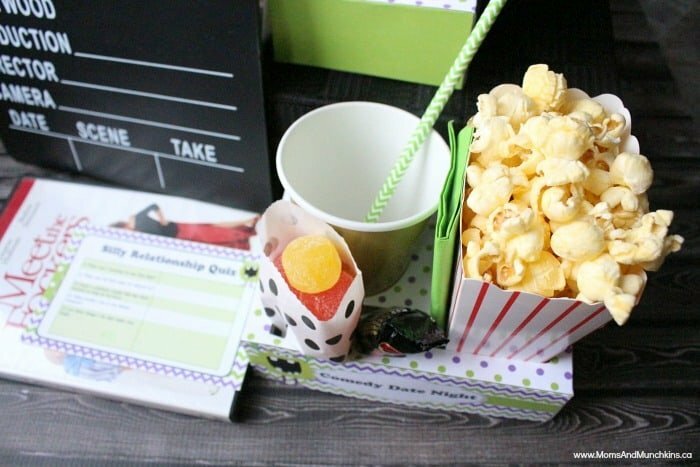 In this free printable pack you’ll find cute printable movie night snack boxes. Print these on heavy card stock paper, assemble them at home then use paper cups, paper popcorn bags, etc. to fill them with your favorite movie night snacks. We’ve included a short & silly relationship quiz that you can take together. 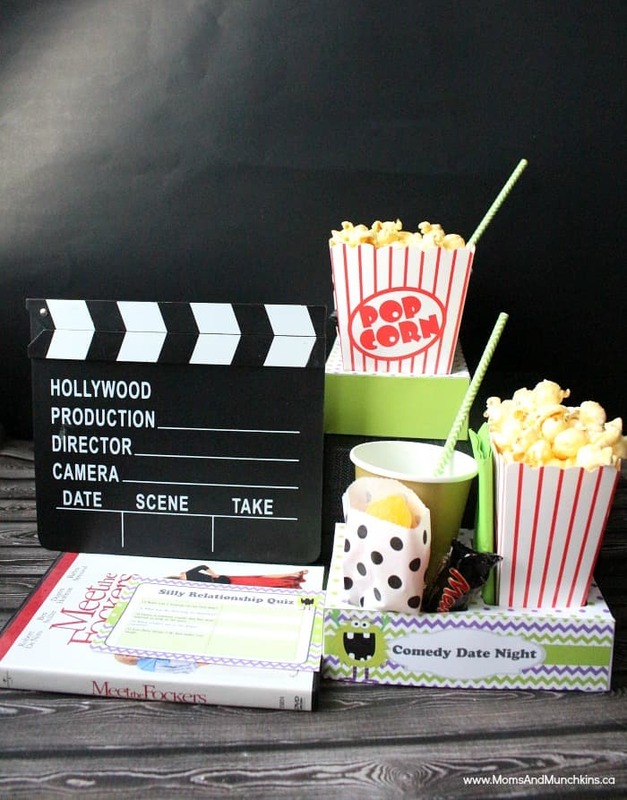 You’ll also find a “comedy” label that you can use to create a date night box – a box full of supplies for your comedy movie date night like the printables in this pack, movie night snacks, a comedy movie, a book of jokes, make up some silly riddles to solve around the house, etc. Step 1 – Print the both pages of the Snack Box on to good quality card stock paper. Step 2 – If required carefully score along the fold lines for easier folding. Step 3 – Using a craft knife or scissors carefully cut out the outline shape of the box top and bottom. Step 4 – Using a craft knife or scissors cut along the sides of each white tab marked “glue tab” – this will create the flaps for the sides of the box. Step 5 – Using a craft knife carefully cut out the white circle and 2 white rectangles on the “box top” to create the snack areas. Step 6 – Next cut along the two grey straight lines on both of the white rectangles. Carefully fold along the sides of each rectangle and push back the triangle shape to create the food and snack sections. Step 7 – Fold back each of the white tabs marked “glue tab”. Step 8 – Then glue or tape the “Glue Tab” sections and attach to the reverse of the flap next to it – this will create the sides of the top and bottom of the box. 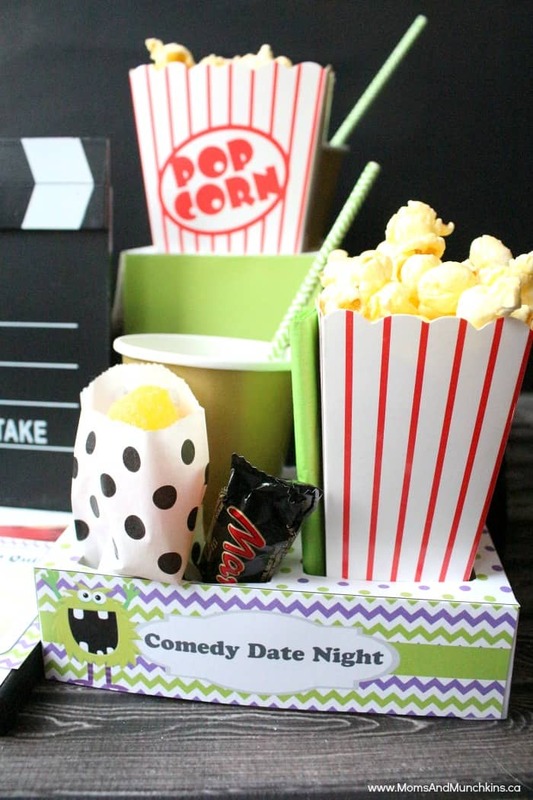 Check out our Date Night page for even more fun ideas & free printables! 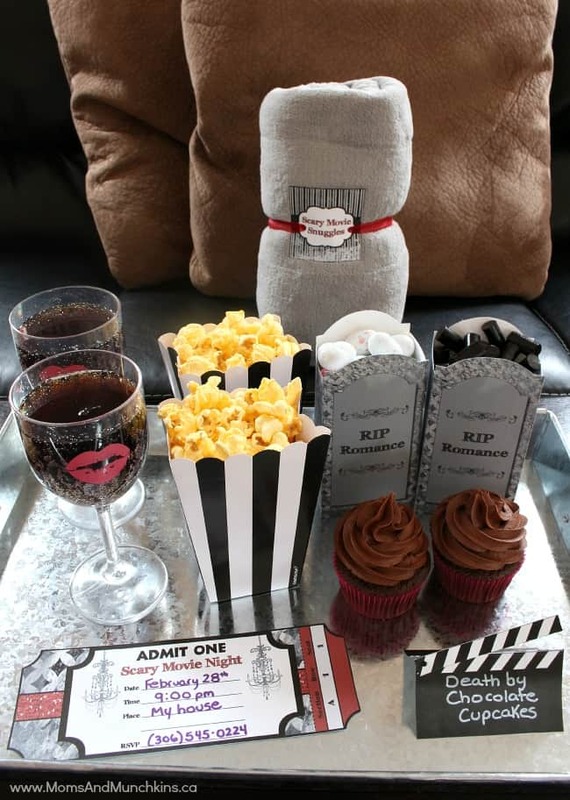 One of our favorites is this Scary Movie Night pack available in our Etsy shop. *Monster clipart courtesy of ©MNINEdesigns. Thank you to Wendy of Wendy’s Printable Party for designing these for us.